Are we missing the opportunity to reach struggling learners from the very beginning? Are we hastily--and unnecessarily--referring students to intervention programs that substitute for high-quality core instruction? What if we could eliminate the need for intervention programs in the first place? Response to Intervention (RTI) programs are only as powerful and effective as the core instruction on which they’re built. High-quality instruction, then, is the key ingredient that helps all students excel, and it’s at the heart of Douglas Fisher and Nancy Frey’s unique approach to the RTI model--Response to Instruction and Intervention, or RTI2. 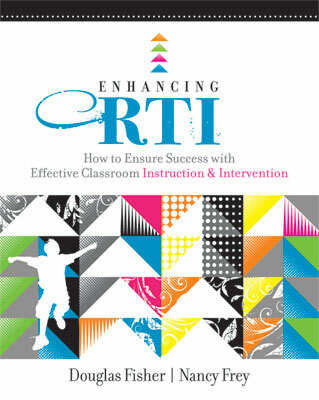 In Enhancing RTI, the authors argue that students learn best when classroom instruction and supplemental intervention mirror each other in both content and purpose. Integrate and align core instruction and supplemental intervention. Assess your own classroom instruction, in addition to your students’ responses to it. Strengthen existing school improvement efforts within an RTI2 framework. Utilize systematic feedback to raise student achievement. Fisher and Frey maintain that the RTI2 model not only promotes active student learning, but it also, when done right, promotes a culture of hardwired excellence at all levels of instruction. DOUGLAS FISHER, PhD is a professor of language and literacy education in the Department of Teacher Education at San Diego State University and a teacher at Health Sciences High & Middle College. He is the recipient of an International Reading Association Celebrate Literacy Award, the Paul and Kate Farmer Award for excellence in writing from the National Council of Teachers of English, and the Christa McAuliffe Award for excellence in teacher education. NANCY FREY, PhD is a professor of literacy in the School of Teacher Education at San Diego State University (SDSU) and a teacher at Health Sciences High & Middle College. Nancy is a credentialed special educator and reading specialist in California. She is the recipient of the 2008 Early Career Achievement Award from the National Reading Conference and the Christa McAuliffe Award for excellence in teacher education from the American Association of State Colleges and Universities.